For those who own a BMW 3 series F30/F31/F35 or BMW 4 series F32/F33/F36 and want to upgrade the factory small 6.5 inch/8.8″ screen head unit with a larger touch screen GPS navigation system, an aftermarket 10.25″ touch screen Android GPS navigation unit is your best choice, which allows for a big step forward in your display and navigation & multimedia system no matter if your car comes with factory navigation or not. 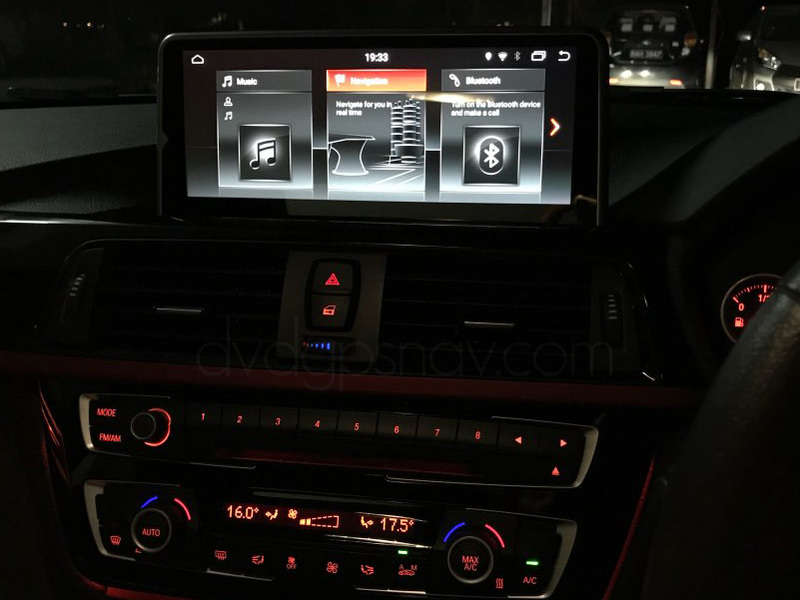 How to install this Android BMW F30 GPS navigation touch screen head unit? 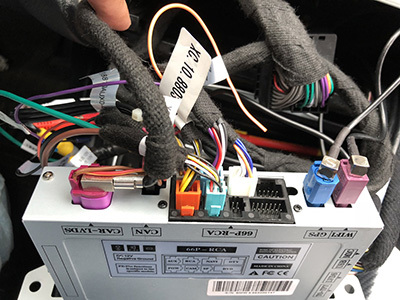 Well, before the DIY, you should at least know some electrical acknowledges at least, if you have installed a similar head unit before that would be great. Please remember doing the work slowly and carefully, don’t force anything and don’t rush. If you have any questions while installing, just stop it, then contact DVDGPSNAV for help, you can take some clear photos to show and explain all your doubts or questions. 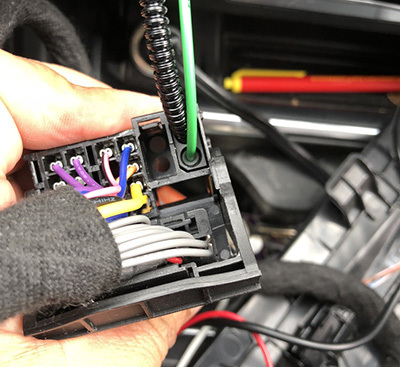 If you are really don’t know how to start and have never installed an aftermarket head unit before, just ask a professional car stereo shop to install it for you, the installer should be responsible, because he may not install such a unit before and he may have a question while installing, a responsible installer is willing to ask for a help from the supplier of your Android head unit. Factory dashboard with 6.5″ small screen head unit from 2012 BMW 320i with working aux. Firstly use a trim tool to pry the corner of the trim and gently pull out the air vent, remove the 2 plugs behind and set the vent aside. 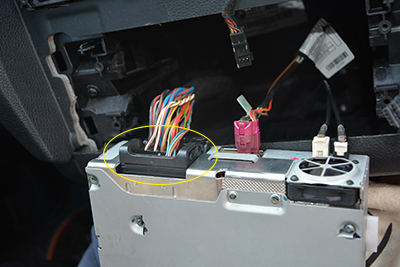 Remove the 2 screws(left and right side) to free the CD and climate control panel, then pull out the cover panel. Remove the top 2 screws to free the factory screen, and gently pull out the screen, remove the LVDS plug behind. 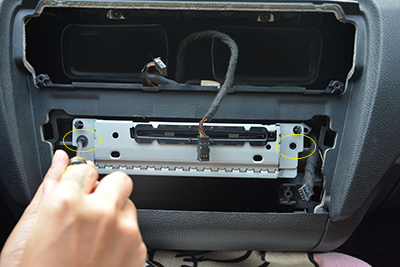 Remove 2 screws of the CD player, so that you can pull out the CD player. 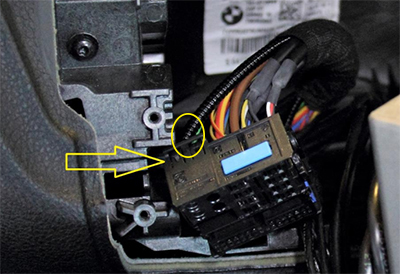 You need to unplug the harness behind the CD, so you have got 2 plugs, one female wiring harness and one male plug behind the CD, connect the female harness with the new male plug, connect the male plug behind the CD with the new female plug. 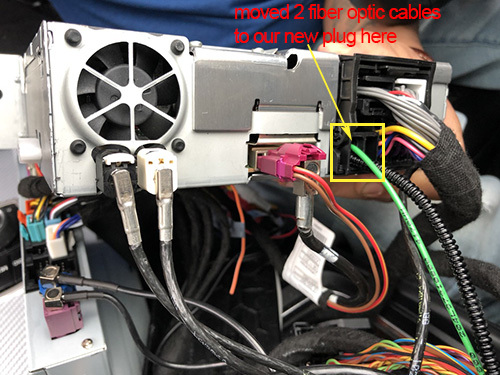 If there are green and black fiber optic cables from your factory wiring harness, you will need to move them to our new plug at the same position, if not, there will be no sound or the unit will not work properly. 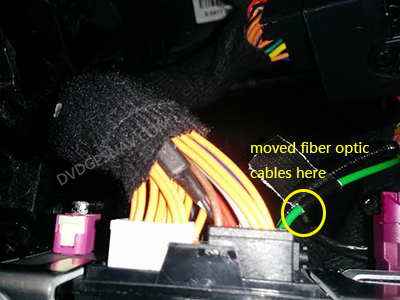 Gently lift the indicated tab, and slide out the connector for the black and green optical cable, then install the optical cables in the same position in the male plug of the provided adapter cable. 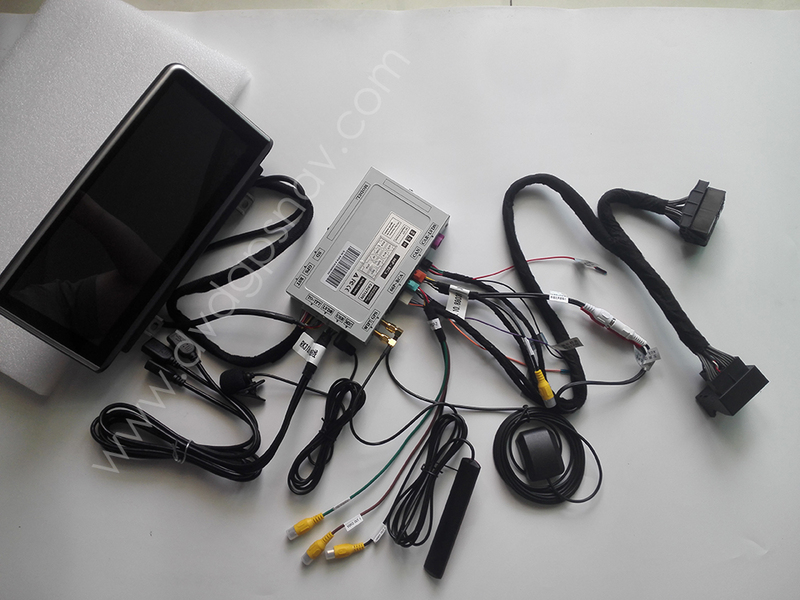 Now you can connect the 2 screen cables with white plugs, 2 plugs from the back of the screen, 2 plugs from the main unit: LVDS, TO-TFT, if you check the connectors carefully, you will find which cable should connect which connector, that’s easy to find it out. 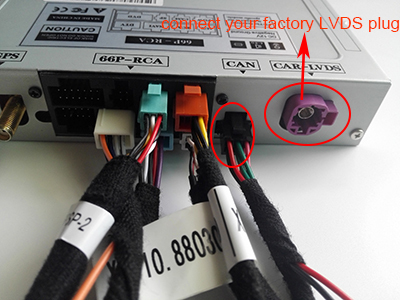 Connect factory LVDS plug with the main unit named CAR-LVDS. Connect the provided black small plug with CAN connector, and connect other plugs with different colors to the related connectors from the unit. Important note: Please check the connectors carefully, then you will see every plug is different, make sure you don’t connect wrong, and don’t use force to push the plug into the connector, if the plug matched, you should be able to push it into the connector easily. Note: You can click the above image to view larger. 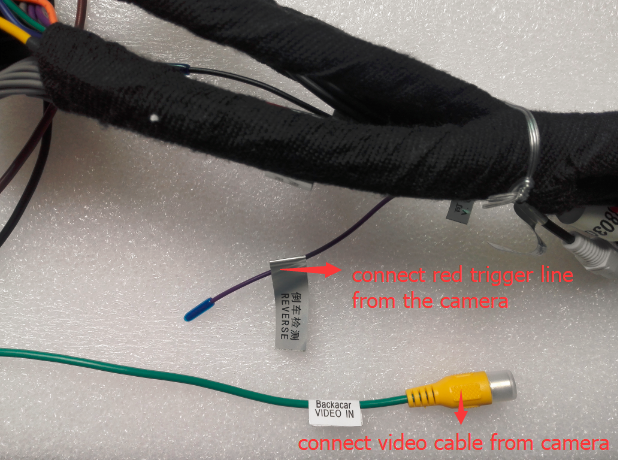 If you want to connect an aftermarket rear view camera, firstly the camera should be powered with your car reverse light, secondly, there are one green cable with RCA connector to connect the video input from the camera, and there’s a loose REVERSE wire which should also connect the red trigger line from the camera. 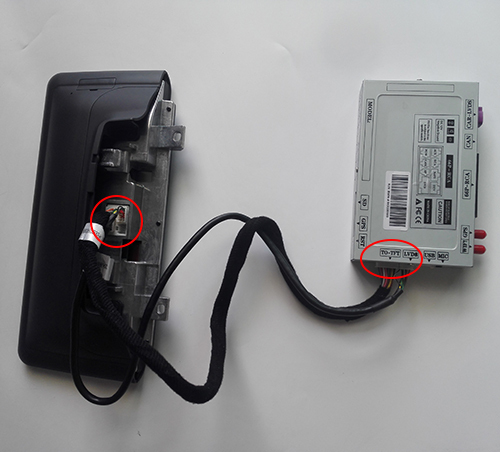 Note: If you have connected the camera correctly, but still no signal or the display is not stable, that’s because the voltage from your car reverse light is not stable, you can connect a relay to solve this, if you need more info about the relay, you can contact us we can send you some pictures. 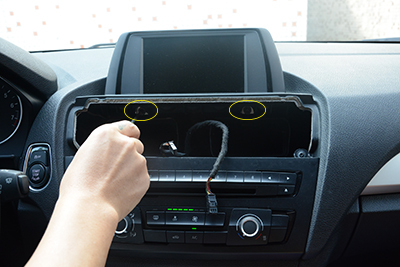 Double check all connections, install the new screen at top, reinstall the head unit and A/C controls and other things, since you have already done how to remove these parts, you should also know how to reinstall it back to its position. After all was done, it’s time to test, turn on the car and watch the screen to boot up, and test function. If there’s no sound from Android menu(music or video playing), firstly please check if you have activated factory aux mode, switch to aux mode, and see if aux can be selected, if it’s dark grey and can not be selected, please check if you unplugged the iPod. 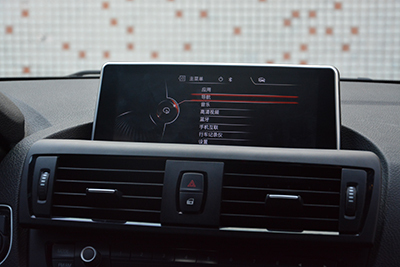 With this new 10.25″ BMW F30 touch screen, you are able to see original menus and new menus, the original menu is controlled the same as before, new menu are touch screen operation. How to switch between original menu and new menu? Original menu to new menu: long press the “MENU” button for about 3 seconds. New menu to original menu: Just press CD, RADIO or MENU. 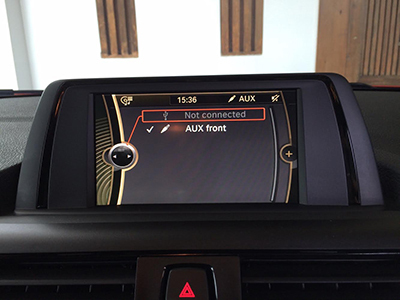 If you want to hear the music sound from new unit, you need to turn to original AUX mode firstly. How to turn original menu to AUX mode? 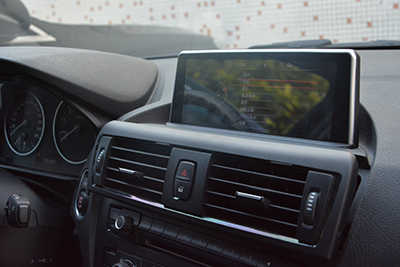 In original menus: select CD/Multimedia > External devices > AUX front > AUX active > Volume. Note: The AUX volume may not so loud as the radio or CD’s volume, so you can turn the AUX volume from low to highest. switch the screen to original menu, play radio or CD, the unit is playing radio or CD now. the screen will automatically switch to new navigation mode now, so that you can hear the sound at the same time. All in all this isn’t a hard project but just a little detailed if you haven’t done this kind of work before. You can send this installation DIY guide to your installer before installing. While installing if you or your installer still have any questions, you can take some photos for us to check, DVDGPSNAV will do the best to help. 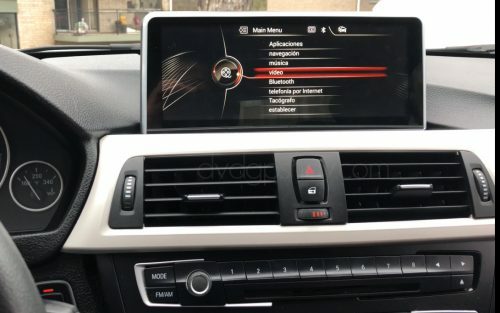 and i want to upgrade the factory screen head unit with a larger touch screen GPS navigation system 10.25″ . is it possible to do it …??? and how much it will coast shipping to KUWAIT ..??? This unit does not support BMW 6 series. Hi, yes, this BMW F30 head unit is compatible with your 2015 BMW F30 320d. For any other inquiries or questions you may have, please contact us on our website by clicking the link in this post so that we can reply you quickly. i have basic 6,5 screen, no NAV but i have harman kardon audio set and rear and mirror original cameras and top view park (both options with the simple rear camera view when reverse in on). With this audio system will i loos harman kardon quality and top view retro camera funzions? 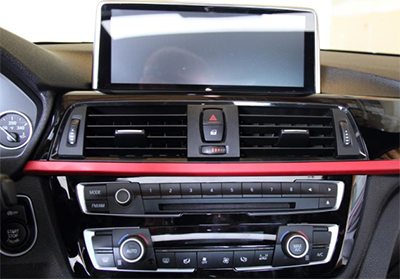 This 10.25″ Android screen upgrade for BMW F30 keeps factory functions working, just a replacement of factory small screen, and not change factory functions, so they can still work after installation of this BMW F30 Android screen. If I buy a car that doesnt have factory built in display, any kind at all, can I buy this product and mount it on my dashboard? 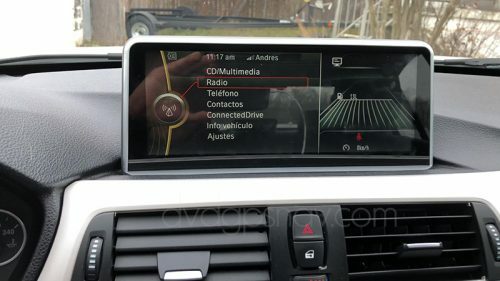 Im concerned about wiring and wires missing from dashbord where display is to be mounted, on top of the radio and ac buttons. Is it possible to connect/wire your device “from scratch”? 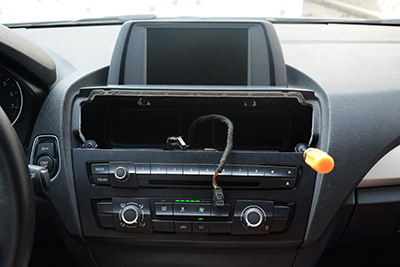 Hi, our unit can only fits BMW F31 with factory screen, if your car does not have factory screen, the dashboard is different so it will not fit.